In a graphic video posted on Liveleak, a white girl was grabbed and beaten while still holding a toddler by a young black teen. The incident occurred at Brookside Park in Indianapolis earlier this month. 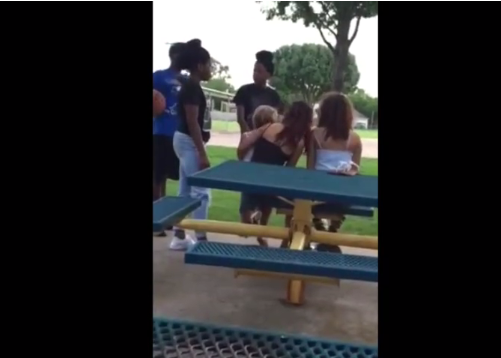 Two young black females demanded that the white girl “get up” so they could fight. When the girl, still holding the child, didn’t oblige, the attacker grabbed her by her hair and commenced attacking her. Once again we have very insightful and historically accurate commentary by AlfonZo Rachel, a Christian conservative and social/political humorist who produces video commentaries called ZoNation on PJTV.com. This rants call out liberals for their complete ignorance of the party that exploits them and the actual history of the hate groups they rail against which is actually created by their party. One can only imagine the shock and horror the 11-year-old felt as her shower curtain was ripped away by a complete stranger dressed in body armor. There she stood completely naked with a member of SWAT pointing an assault rifle at her. Downstairs, other cops were ransacking their house screaming profanities in the form of orders to her traumatized family. The American Geophysical Union published an article last month detailing a newly discovered fragmentation of crust and displacement of seafloor off of Southern California and northern Baja California. Looking at the recent great uptick of earthquakes see as of late, this new information certainly gives one pause. Using a GoPro camera, an ISIS jihadi recorded the moment he was shot by an Iraqi soldier. The 2-minute clip on the following page shows militants in combat with the Iraqi military. The fighter is heard screaming “Allah Akbar!” a few seconds into the clip, which appears to have been cut and spliced with fighting that occurred later. The great state of Texas just dealt a major blow to the Federal Reserve. Last Friday Gov. Greg Abbott signed House Bill 483 into law, which will create the nation’s first state-level bullion depository. The Lone Star State just doubled down on their reputation as being ‘hostile’ with the feds. But this law has another component that is surely ruffling feathers in Washington. What would happen if Jihadists went door-to-door just like Jehova’s Witnesses? While one might find the latter a bit of an inconvenience with their visits and proselytizing, at least one would not expect to lose their life upon failing to convert! Louder With Crowder continues to entertain with this funny little clip on the next page. Many residents in a north Iowa community are shocked and upset over the removal of veteran military grave markers from the Charles City cemetery. Regardless of the manner of death, the Department of Veterans Affairs furnishes military markers at no charge to applicants for the unmarked grave of any deceased, eligible veteran in any cemetery around the world. Now one cemetery in Iowa is suddenly removing these markers from its grounds.